This recipe is super easy. The spices are wonderful together and it makes a great family meal. You won’t believe how great this smells. Enjoy! Preheat oven to 425°F. Oil a large roasting pan and set aside. In a small bowl, combine paprika, cumin, salt, pepper, garlic, vinegar and oil to make a paste. Place onions in a large bowl and toss with 2 tablespoons of the paste. 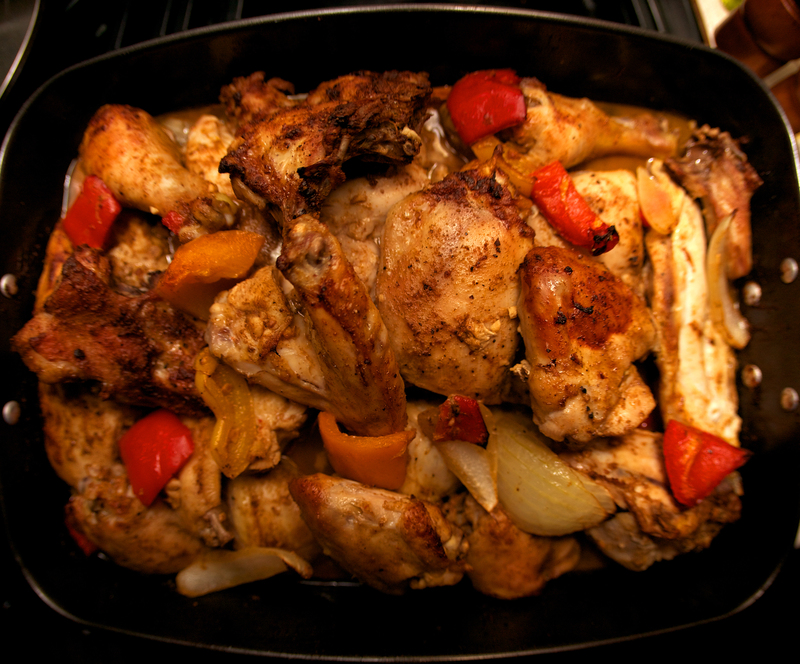 Rub chicken pieces with remaining paste and place in prepared pan, then cover with onions, peppers and lemon. Roast, basting occasionally with pan juices, until chicken is cooked through and vegetables are very tender, about 45 minutes. Remove from oven and let rest 5 minutes before serving. Serve with white rice. If you are making 2 chickens (as pictured) double the paste recipe. This entry was posted in Uncategorized and tagged chicken, Peruvian, roasted chicken. Bookmark the permalink. That looks great – how many would 1 chicken serve? 2 chickens? Would you also double the veggies? Servings are kind of hard to determine Karan. There are eight pieces per chicken. I made 2 chickens here and used the same amount of veggies in the recipe. I guess it all depends on what you like more or less of. Definitely gonna give this a whirl, but how do I print it? I mean, is there a printable version? Do you think this could be done on a Weber gas grill?? It looks fantastic!